Santa’s Village is a tiny town of 16 holiday dwellings on the north side of City Hall (at 411 W Arapaho Rd) that has delighted children of all ages as they travel from one tiny dwelling to another to experience holiday crafts, treats and activities. The holiday attraction has become an annual tradition for families. Visitors can enjoy holiday themed performances by local community choirs, dance groups, theaters and musicians on Prancer’s Stage at Santa’s Village. Performances take place each evening starting at 6:00 p.m.
Santa and Mrs. Claus are also on hand to visit and take photos with kids! 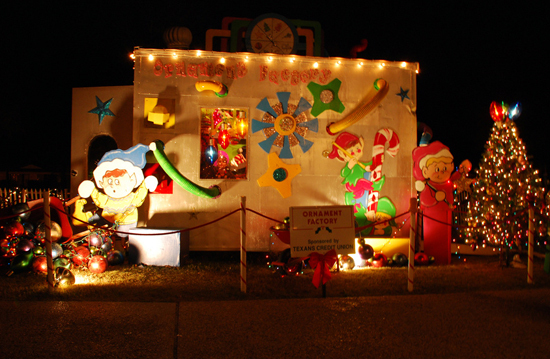 Santa’s Village is located on the lawn at the City Hall/Civic Center Complex, 411 W. Arapaho in Richardson, TX.